I know, you're all aware about the new Asian restaurant The Wok in Ljubljana, but I couldn't help myself writing a few words. The super trendy orange can be easily seen probably from all parts of the town, so I just had to check it out. When I first entered the place, I was surprised by the crowd and the way you're served. Remember: you order and pay for the food at the register, where you also get a receipt with a number, which represents your place in the queue. It did take a bit of a wait; "7 minutes" as said by the cashier, but it turned out to be more than that. No worries, while I was waiting, I was rather intrigued by the hard working chefs, who performed quite the show by tossing ingredients around and an occasional fire stunt. Finally, my number was up! 42, that's me! The nice lady took my noodle cup and placed it carefully in the bag, which I did not ask for, but no biggie, I just really want to eat, as I'm getting quite hungry. Grabbed a pair of chopsticks and some napkins and away I go. 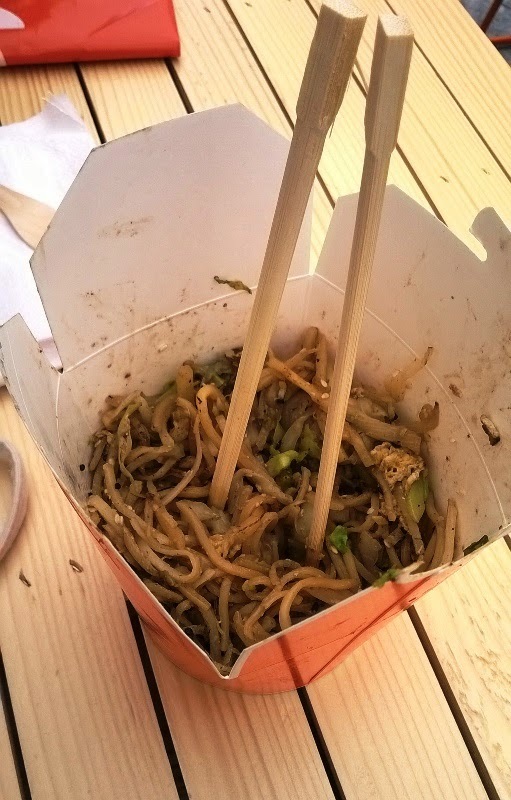 I did manage to find a seat outside, broke those pesky chopsticks and started munching. Wow. Very good. Very good indeed. This is great, the taste kinda reminds me of some other pricier restaurants in Ljubljana, but this is cheaper! You can get your noodles for 4,99 euros, the extras are from 60 cents onwards and the sauce is free. I had classic egg noodles with vegetables with extra bamboo shoots (I asked for bean sprouts, but got bamboo instead) with the so called "Taste of Asia" sauce, which consists of soy sauce, oyster sauce and something something. I recommend this new fun food joint, and will visit it again.